South Pass City has a variety of interesting and educational activities for visitors throughout the summer. When the presence of volunteer staff permits, not only can you walk through each of the 17 restored and exhibited original structures, you can enjoy an ice cold sarsaparilla and a game of billiards on a restored 1860s period table, as well as hear the ring of a hammer on steel when the blacksmith shapes hot iron. Each day, one can shop in the historic Smith-Sherlock General Store or pan for gold in the clear waters of Willow Creek. In the Interpretive Center, you can also learn about other gold producing methods that have been used around South Pass City throughout its history. For folks with as much interest in nature as history, South Pass City is home to a three-mile Volksmarch Trail where you can enjoy viewing some of the area's wide array of wildlife. mule deer, antelope, moose and beaver are just a few of the animals that can be seen. For birders, many species call this area home at different times of the year, including mountain blue birds, finches, hawks and eagles. Anglers will enjoy blue ribbon fishing for brook, rainbow, brown and cutthroat trout in many of the area's streams and lakes. The Continental Divide National Scenic Trail also passes through town. Popular among serious hikers and mountain bikers, the Continental Divide National Scenic Trail runs the length of the Rocky Mountains from Canada to Mexico. Each year, numerous bikers and hikers utilizing this trail visit the site. Many use the general delivery at the General Store's post office for re-supply, and enjoy a tour through town before continuing on their journey. Celebrate the 150th Anniversary of the founding of South Pass City with a special celebration of Gold Rush Days, July 7 and 8. The annual South Pass City State Historic Site event is $5 for adults and $3 for children 12 and younger. This year’s event features a special appearance by Chancey Williams & the Younger Brothers Band on the evening of July 7, followed by a fireworks display like no other in Wyoming. 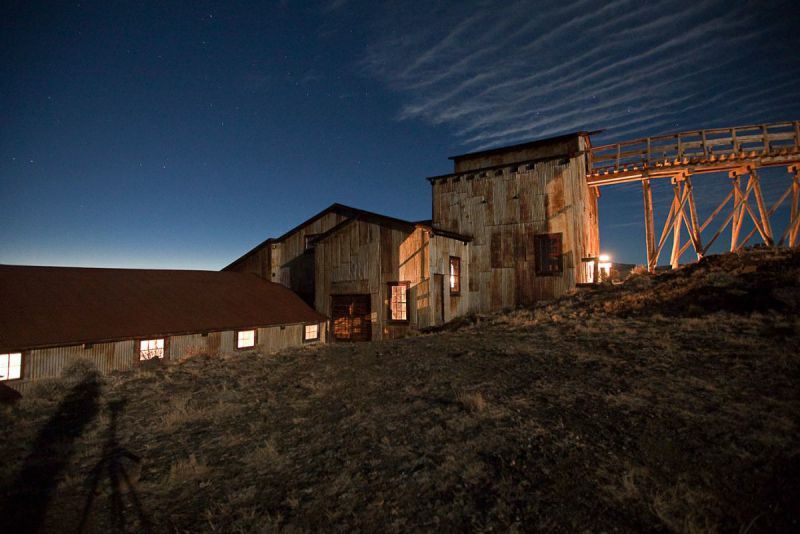 Experience American history brought to life in an authentic gold mining camp. Try not to catch gold fever when panning for real gold in a glacial fed stream. Additionally this year, the Hudson Vintage Base Ball team defends its 2017 Championship against South Pass City, Lander. This tournament features teams in vintage 1906 uniforms and using 1906 rules. Other activities include Pony Express rides, pack mule demonstrations, faro players, immigrant trail re-enactors, gold panning, home baked goods, musical entertainers along the street and the ever popular anvil blasting. The Carissa Mine will be in full operation both days from noon to 5 p.m., as well as mining demonstrations on the Flood and Hindle Trail. The event is sponsored by the Friends of South Pass and the 150@150 group of sponsors. For more information call (307) 332-3684. View more updates for South Pass City Historic Site!